Westminster sculptor Chuck Ginnever, who turns 87 this month, once sat in a New York gallery and watched people look at a 25-foot-long work by Tony Smith. The experience alarmed him. Like Smith's work, Ginnever's is large-scale, metal and abstract. "All the people from our culture walked up, looked and left. Americans thought they knew everything about it by standing still," he recalled. "I've been fighting against that all my life. The only way to see my work is to use your feet." While most sculpture calls for in-the-round viewing, Ginnever's creations of the past 60 years — he made his first significant work at age 27 — transform that visual journey into a continuous surprise. Works that seem to make sense from one angle look like entirely different sculptures from another, and something else again from a few steps on. Ginnever's ability to challenge expected modes of perception has made him one of the seminal large-scale sculptors of the 20th century, along with his contemporary Mark di Suvero and the older Tony Smith. 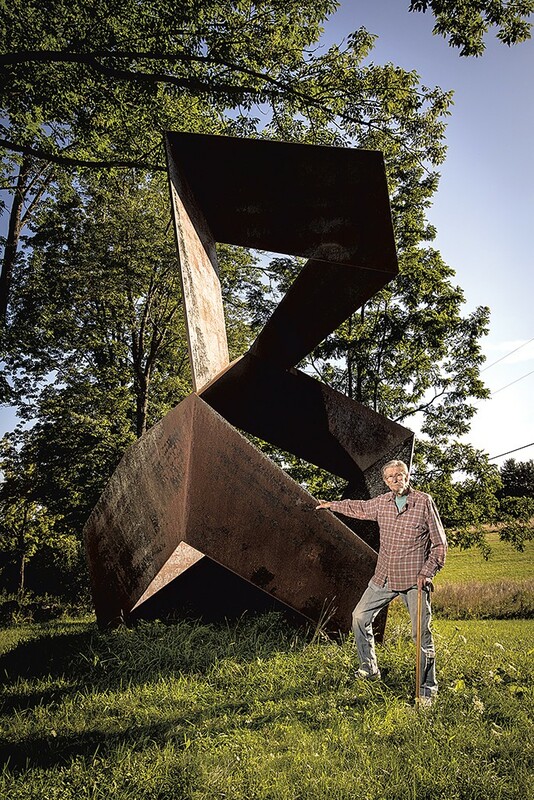 His work graces the grounds of Storm King Art Center in Cornwall, N.Y., the Hirshhorn Museum in Washington, D.C., the Seattle Art Museum and many places in between, provided they have acreage sufficient for his up-to-40-foot sculptures. One with a 70-foot span, "Green Mountain Blue II," sits outside the National Gallery of Australia in Canberra. Perhaps only the outback can do it justice. Vermonters who haven't heard of Ginnever may be forgiven: Apart from the works on his property, only one of his sculptures is sited in Vermont. That work, "4 the 5th (of Beethoven)," has been on loan to the Southern Vermont Arts Center in Manchester since Ginnever created the 20-by-40-by-30-foot sculpture in 1972, on commission from the Vermont Arts Council. Earlier this month, however, "4 the 5th" moved to Landmark College in Putney on the initiative of president Peter Eden. 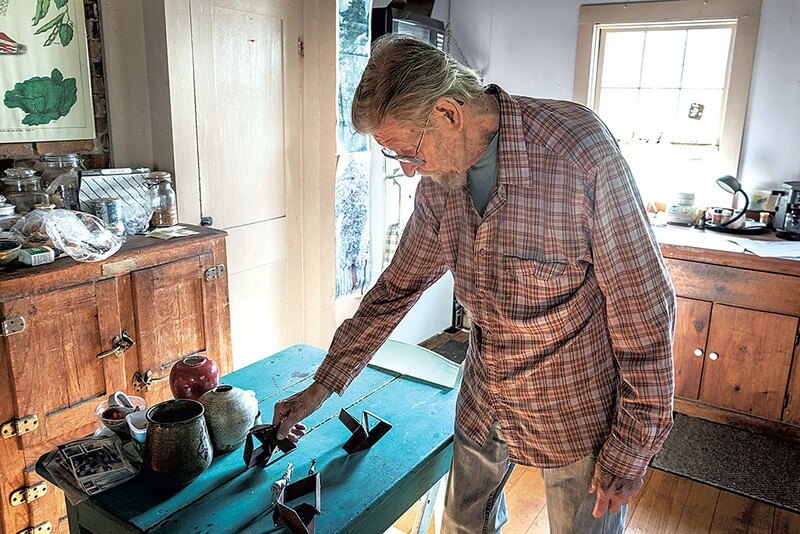 In a sense, it has come home: Ginnever taught sculpture and life drawing at the campus, then Windham College, from 1967 to '75, and headed its art department from '70 to '71. While "4 the 5th" was in transit, Seven Days visited Ginnever at his 1768 farmhouse, which he bought in 1969. As visitors approach, they get an introductory lesson in the artist's intention, via a dirt road that bisects the 51-acre property of rolling, wooded hills and hayfields. On the inside curve of a hairpin turn, Ginnever has sited "Untitled," a 9-foot-high piece composed of triangles made from sheets of steel weathered to a coppery brown patina. Some appear folded, creating two triangles in different planes. The forms seem to lean together, touching only at their pointy tips, leaving geometrical voids in between. Visitors cannot help but see the work from almost every angle as they proceed to the farmhouse. And every view, from one moment to the next, confounds expectations. Is each section bent, or only some of them? How does the whole stand so solidly while seeming both to fall in a cascade and to spring up from the weeds, depending on the point of view? Ginnever, with his goatee, feathered hair, button-down shirt and slacks, subverts expectations himself. Seated for the duration of the interview in a wingback armchair, he's had two open-heart surgeries in the past decade, he said, and isn't up to showing visitors his outdoor sculptures. Yet he was just back from a major trip to Lincoln, Neb., and Clarinda, Iowa, where he attended openings for a multisite show of his work. Accompanying him were his two ex-wives, two daughters and the artist David Rohn, the longtime neighbor and friend who hired Ginnever at Windham. Collectors Karen and Robert Duncan of Lincoln, owners of a jet maintenance company, arranged the show, transporting nine of Ginnever's works from California and nearly two dozen from Vermont. A neighboring farmer with a small trailer took the latter group of works one by one past that hairpin turn before loading them onto four 40-foot flatbed trucks, Ginnever said. The sculptures have been sited around both Midwestern towns as well as on the Duncans' Lincoln property and at the Clarinda Carnegie Art Museum, a former library the couple bought and restored in 2012. Despite these departures, a surprising number of works were visible from the house on Seven Days' visit. Among them were early gestural works that recall abstract-expressionist paintings of the era, such as "Ithaca" (1959), made from found wood railroad ties and steel rails bent into swoops. Ginnever's larger, post-1964 works are all geometric. Clearly influenced by minimalism, they nonetheless reject the immediately graspable right-angle geometry of, say, Donald Judd or Sol LeWitt. Set in a hayfield, "Troika" (1976) evokes two mammoth, skewed-perspective window frames joined at an angle. As one walks around the substantial forms, trying to determine how they jut or recede in space, they improbably shrink to vertical slits and grow again, while the changing voids capture successive views of the landscape. Ginnever calls this activation "breathing." A 10-foot-high prototype of "Rashomon" (1995) sits across the road from the house. Perhaps Ginnever's best-known work, this is a suite of 15 copies of the same sculpture, meant to be shown together in 15 different positions. In the Nebraska-Iowa show catalog, David Ebony, a contributing editor at Art in America, aptly describes the form as "a kind of Möbius strip made of narrow, twisted steel planes." As in the Akira Kurosawa film for which the suite is named — in which four witnesses recall conflicting accounts of the same crime — each position seems to delineate an entirely different sculpture. "It's virtually impossible to get your head around it," Ginnever said. Those who tend to understand his sculptures right away are engineers, mathematicians and architects, he added: "People think I have a good math background, but I don't. My geometry is self-taught. I've been told by heads of math departments that I've invented my own geometry." Ginnever was born in San Mateo, Calif., and attended junior college there. A member of the National Guard since high school, he was called up during the Korean conflict but "only got as far as Spokane." After that war, he went to Europe on the GI Bill to study art for two years, including in Paris under sculptor Ossip Zadkine and renowned printmaker Stanley Hayter. "[Joan] Miró watched me pull a print one day. I didn't know who he was," Ginnever recalled. Ginnever returned to the U.S. to earn a bachelor's at the San Francisco Art Institute and a master's in fine arts at Cornell University. In 1959, he moved to New York City, found a low-rent loft and began making his found-materials sculptures, as well as "sketching" with a hand-me-down 16-millimeter camera. A New York gallery, Allan Stone Projects, gave him his first solo show in 1961. His second, in '65, was held at Bennington College, then still all female, at the invitation of art critic Lawrence Alloway. Because rival critic Clement Greenberg held sway with many art faculty and students, however, the show was poorly attended, Ginnever recalled. The college refused to return the works at show's end and tore the largest apart, he said. Meanwhile, Ginnever was doing stints of teaching art and participating in the '60s "happenings." He mounted Ergo Suits, a 1962 traveling artists' carnival held in two New York towns, to which he invited the nascent Bread and Puppet Theater, as well as Eva Hesse, Tom Doyle, Walter De Maria and other artists. Windham provided Ginnever's first steady teaching job. In 1968, he organized "The Windham Show," which he claimed was the first exhibition of commissioned outdoor conceptual art in the country. It featured works by Lawrence Weiner, Bob Barry and Carl Andre. The same year, Ginnever revived his carnival and used it to poke fun at the signature structure of Windham's Edward Durell Stone-designed campus: the colonnade. "The students hated the colonnade," he recalled. It funneled rain and melting snow to the underside, where precipitation dripped on them, instead of providing shelter. Ginnever's students created a puppet version of the white structure and, dressed in towering costumes, collided with it until it went down. "Attack on the Colonnade, Windham College," a short film directed by Ginnever, can be viewed on YouTube. In 1980, Storm King acquired two new works by Ginnever and held an opening reception. By that time, the sculptor was already recognized for "invit[ing] the viewer to meditate on the nature of perception," as the sculpture park's website puts it. Storm King's 8-by-17-by-18-foot "Fayette: For Charles and Medgar Evers" (1971) appears simultaneously flat and 3D. "Prospect Mountain Project (for David Smith)" (1979), slightly smaller, seems to invent a new kind of origami in steel plate. Ginnever names his sculptures after they're made. His process begins with playing around with foamcore and a glue gun. A steel maquette comes next. Ginnever cut and welded his own until age 80; now his assistant of 40 years, Frank Sansone, does the job. (The Putney-based marble sculptor's works dot Ginnever's property, and his rendering skills are equally admirable, judging from his proposed design for the World Trade Center site memorial competition.) 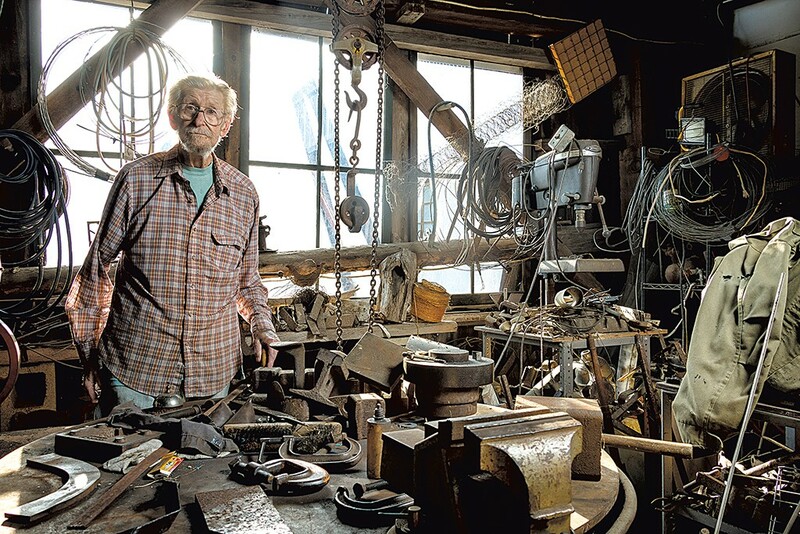 When Ginnever gets a commission, he has the work fabricated by a studio — or "factory," as he called it — such as Johnny Swing Welding in Putney. Lately, Ginnever has turned to a more malleable material: thick paper. His 2012 creation "Multus" is a DIY sculpture made from a 20-by-18-inch piece of triple-ply Somerset paper colored to resemble the patina of weathered steel. It comes printed with solid and dotted lines and instructions on where to cut and bend. The work was published in a limited edition by Landfall Press in Santa Fe, N.M., which also produces lithographs of work by Christo, Judy Chicago and others. Landmark president Eden was after something more permanent when he contacted Ginnever as part of a larger effort to honor the former Windham College and increase examples of creativity on campus. When he visited the artist, he didn't yet know of "4 the 5th." "I wanted 'Troika.' He said, 'No, you can't have that,'" Eden recalled with a chuckle. When Ginnever suggested the piece at SVAC and showed Eden a picture, the president wasn't so sure. Photographs do Ginnever's work scant justice. But, said Eden, "once we [he and executive vice president Jon MacClaren] saw it in person, and saw the scale of it, we were thrilled." The two took Ginnever on a campus tour to scout out sites, and the artist chose the upper ridge lined with dorm buildings — far from the colonnade. The form of "4 the 5th" — a row of four elongated aluminum parallelogram frames, with three set vertically and one flat on the ground — was inspired by Ginnever's photographs of the shadows at Stonehenge. The name he gave it after the fact is equally apt. The famous four opening notes of Beethoven's Fifth Symphony sound in the mind as the eye reads the forms — "Da da da dah." But keep walking. A few steps on, the work becomes something else entirely. Dedication ceremony for Chuck Ginnever's "4 the 5th (of Beethoven)," Friday, September 28, 3 p.m., at Landmark College in Putney. Free and open to the public. The original print version of this article was headlined "Sculpture by Foot"